*What’s up everybody, Bowlegged Lou from Full Force here!! So this past weekend was a grand one. The Holiday concert in New jersey at The Prudential Center was great. All of our friends were there to rock the stage & that they did. New Edition, Patti Labelle, Tyrese, Jaheim & Monica. Crazy line-up, huh?? Everybody killed it with great performances. Me and my beloved brother Paul Anthony & his beautiful wife aka my sis in law, Michelle along with my beautiful gal pal Ashlee Baldwin & our dear friend & former artist Joe Jinx Ghaznavi were special guests along with Busta Rhymes, Eric Sermon, Judge.Mathis, The legendary voice of Blue Magic: Mr Ted Mills, Super Songwriters Jacky Member Poindexter & The Poindexter Brothers of Robert & Richard who penned such legendary hits as “Thin Line Between Love & Hate” by The Persuaders & “Hypnotized” by Linda Jones while co-writing compositions for Tina Marie, Will Smith, Jay Z, Amy Winehouse and The Ojays, amongst others. WBLS 107.5, the #1 urban radio station in the country hosted the event lead by PD Skip Dillard, Shaila, Fred “Bugsy” Buggs, Lenny “Quiet Storm” Green, Deja Vu & comedian great, EarthQuake. OK, let’s cut to the chase. As much as we wanted to reunite with Patti Labelle who we had not seen in ages since we wrote & produced on her Gold Album “Be Yourself” along with Prince writing & producing as well, we especially wanted to reunite with our little brothers New Edition. (We did indeed hook up with Patti in her dressing room & she was so happy to see us again as we were happy to see her too. Alas no Patti Pies backstage. We did see the man who made the Patti Pie famous: Mr James Wright Chanel, though and he later sang on stage with Patti). Anyway, back at the FF-NE Ranch >>> Full Force & New Edition’s friendship & connection go back 25 plus years when they first came to New York to play us in a basketball game which never got completed because during half time they started to do an impromtu minor dance & singing performance on the damn basketball court & though they were just foolin’ around … the fans charged the court and that was the end of that. Flash Forward years later: we had a rematch that BET sponsored in Washington DC. They beat us by luck 55-49 as you will see video highlights of that game attached at the end of this story. What you won’t see is Donnie Simpson who played on our side scoring in the wrong damn basket. Jeeeez! After that game we recruited Biv & Ronnie to play with the Full Force All Stars in a series of Celebrity Charity Games which we won most of them except when we played against Arsenio Hall & his Police Force friends. They cheated. 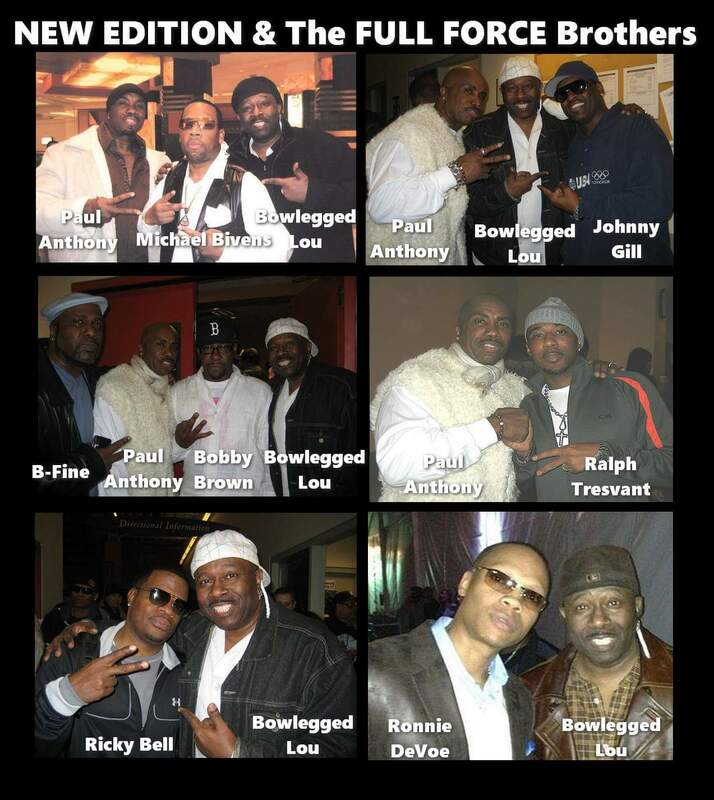 So Full Force’s connection with New Edition began as a basketball connection which lead to a great & respectful friendship. All those years we also befriended New Edition’s master choreographer, manager, artistic director, friend & often called the 7th member of New Edition>Mr. Brooke Payne. 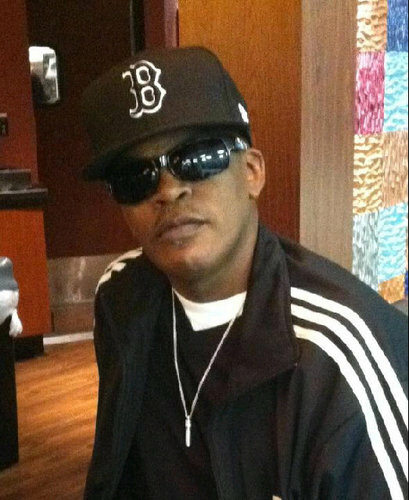 Brooke is also the uncle of Ronnie Devoe. He has been with the group since the very beginning. His over-seeing the fellas is also a spiritual & positive one as well. I have been in a few of those hands all-in prayer circles that Brooke would at times lead before New Edition took the stage. New Edition in my opinion is 1 of the top 5 R&B vocal/dance-steppin’ groups of all time. Brooke’s finger-tips & foot-tips created the blueprint of New Edition’s masterful fancy foot-work of a stage show. His inspiration has touched every member since they were little kids till now as grown men. Ralph, Mike, Ricky, Ronnie, Bobby & Johnny. The day before the concert, I called/texted Brooke and asked as usual if we and our peeps can get backstage passes to say what’s up to him & the fellas. He texted back>Done! I also told him that Paul & i wanted to surprise & present something to the guys from us to them. From Peers To Peers & Brothers To Brothers. Hell, I know New Edition has received prestigious industry & fan awards which are great, but it’s not a lot of times, we as artists give to one another. We have what we call A Full Force Appreciation Plaque which we present out of respect, love and support. So the next day, Friday at the concert while in our seats, Brooke texted me and told me that New Edition would be backstage at 10pm before they hit the stage much later. We saw Monica, Jaheim, Tyrese kill it on stage with their performances. Brooke then texted me and said to come backstage now. So we went backstage with the hidden in a box Appreciation Plaque in hand. We greeted the fellas as they were surprised to see us. Brooke then quieted down everyone who was in the dressing room and he gathered the fellas around & told them, “Okay guys, Full Force has something that they want to present to you.” I started talking by telling the guys how much Full Force loves them. Full Force of course are more than just me and Paul. We have 6 members in our group total with B-Fine, Baby Gerry, Curt-t-t & Shy Shy rounding out the group. I read the poignant and important tribute words on the plaque (picture of the plaque is below after the story) and the words ended with a P.S. to Brooke: “When are you gonna tell everyone that Bowlegged Lou and Paul Anthony taught you everything that y’all know?? Everyone busted out laughing and clapping in Brooke’s honor. Brooke laughed too. Everybody hugged him & we all took pictures. He kept saying that we got him !! He was so appreciative & we appreciated giving it to him. 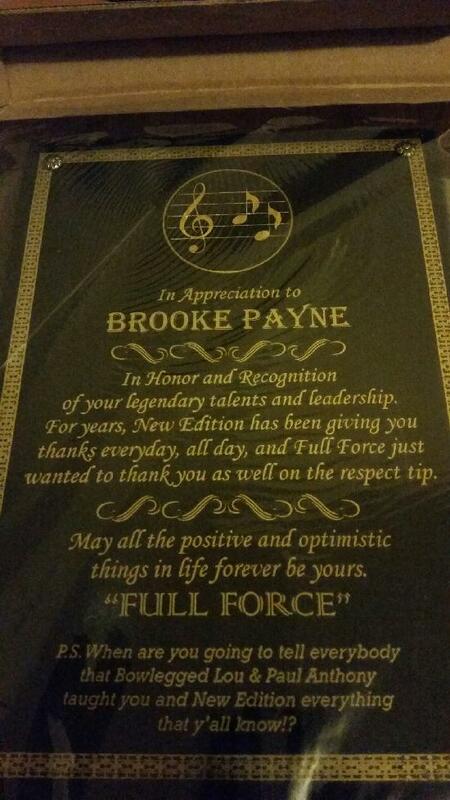 New Edition has always given props to Brooke and thanks him every day all day but we just wanted to add our little Full Force piece on the respect tip also to a man that is truly a legend himself. Ralph Tresvant told me that it’s a good thing that we snuck it in on him because he z(Brooke) is so modest that he might of not wanted anything given to him like that if he knew about it beforehand. And that’s why my name is Bowlegged Sneaky Surprising Lou !! Special shout out to Our beloved Full Force brother Paul Anthony who celebrates his 3rd year anniversary of his bone marrow stem cell transplant he went through with me as his donor. 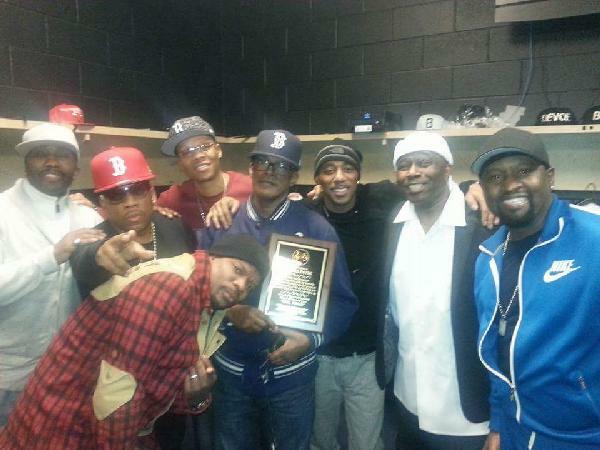 Brooke & New Edition showed love & support when he was going through his Cancer Champion journey. (PALiveLife.Org) Shout out & Thanks also to David Rodriguez, Bill Stephney, Evan White & Kira Ruth of The NJ Pac Team & Broad Market Media team. Enjoy the videos & pics below.